Solving The Ultimate Professor Layton Mystery: When, Exactly, Do the Games Take Place? 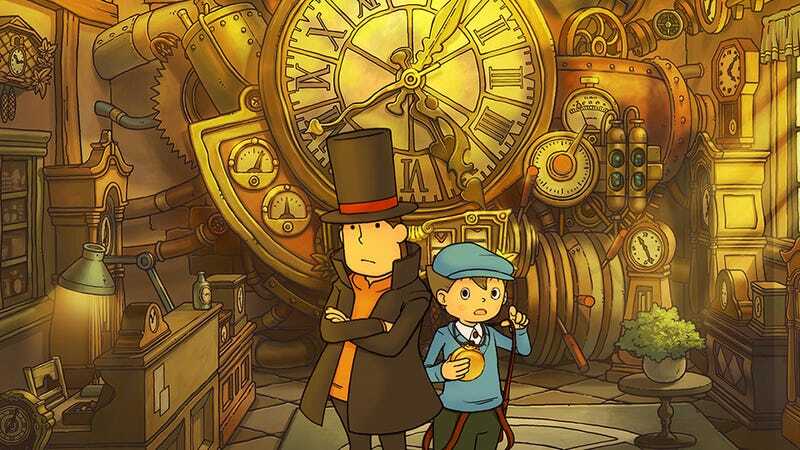 With the release of Professor Layton and the Azran Legacies this past Thursday in Japan, I've found myself thinking a lot about this series—perhaps too much. The Professor Layton games follow the titular Professor Hershel Layton, a professor of archaeology based in London who—like famed Dr. Henry Jones, Jr.—spends far more time solving ancient mysteries and discovering mystical artifacts than teaching at a college campus. And after six games (ten, if you count crossovers and spin-offs), three books, a movie, and a manga, only one mystery remains: When, exactly, does it take place? "As far as a time/year goes for the main Layton series, Hino-san has expressed sentiments before that, to paraphrase, the Layton series is a fantasy with realistic elements, not a grounded tale that you could pin a year onto. To my personal knowledge, no years, nor even a timespan has ever been made public, or have been necessary to enjoy Layton's very fictional version of London." So really, we could just leave it at that and forget about the issue entirely. While finding an exact date is likely impossible, we can at least put together a time frame for the story by looking at the objects that make up the games' world. After all, the series takes place in a world at least based on our world, as we can see by Layton living in the very real city of London. Layton's car, for example, bears a great resemblance to the French-made Citroën 2CV which was produced from 1948 to 1990—which would have the games taking place after 1948 at least. We can move the potential starting date ahead even further thanks to one of modern London's most recognizable features, the red Routemaster double-decker bus. These first entered service in 1956 and continue in a limited capacity to this day—which puts the games sometime after that. If we choose to include Professor Layton VS Ace Attorney—which as a side story may or may not be in continuity with the other Layton games—we can move our possible starting date up to at least 1970 as Phoenix and Maya fly into London on what appears to be a 747 which entered service that year. Of course, if we want to get into the real nitty-gritty of Ace Attorney lore and use that series' time line, then Professor Layton VS Ace Attorney would have to take place between the time Maya becomes Phoenix's assistant in 2016 and his disbarment in 2019—setting Professor Layton series in the same basic span of years. But even setting aside Professor Layton VS Ace Attorney and its dubious continuity for the moment, the puzzles themselves in the Layton games give hints to the possible time frame of the series. Puzzle 005 of Professor Layton and the Curious Village, for example, is centered around digital electronic clocks—which became widespread in the 1970s and 80s. Puzzle 067 of Professor Layton and the Curious Village, on the other hand, mentions text messaging between two people in the story behind the puzzle. Cell phone to cell phone texting wasn't available until 1994 and didn't really catch on till about a decade later. So there you have it. Based on the core Professor Layton games alone, the series would take place sometime after 1994. Though if you, like me, are willing to take Professor Layton VS Ace Attorney and the entire Ace Attorney timeline as canon, then the events of the Layton games have not even happened yet. So in the end, maybe Layton isn't set in the past, but in an awesome future where 1950s-retro meets steampunk—clearly, the best possible of all worlds.